OSHA and Dollar Tree Stores Inc. have agreed to a nation-wide agreement, settling all safety and health citations issued against the company following inspections at 13 stores across the country. Under the corporate-wide agreement, which covers workers at about 2,400 stores, Dollar Tree will eliminate hazards related to blocked emergency exits, obstructed access to electrical equipment and exit routes, and improper material storage. The company will also pay $825,000 in penalties. Dollar Tree agreed to develop and implement a comprehensive safety and health program consistent with OSHA's Safety and Health Program Management Guidelines. The retailer also agreed to: publish a corporate newsletter on safety and health issues; arrange for a third-party monitor to audit 50 company stores; inspect a portion of its own stores for three years; encourage use of a new toll-free number for employees to anonymously report safety and health issues; and work with OSHA to monitor implementation. An OSHA inspection of two Case Farms processing facilities in Ohio found deficiencies in the ammonia refrigeration systems. The supplier of fast food and supermarket chicken was cited for 11 repeated, four serious and two other-than-serious violations at its Winesburg plant and fined $308,000. Five repeated and three serious violations were issued at its Canton plant, with $154,000 in penalties. "Case Farms needs to protect its workers—period," said OSHA Assistant Secretary Dr. David Michaels. Case Farms also failed to provide hepatitis B vaccines for workers exposed to bloodborne pathogens; perform annual bloodborne pathogen refresher training; and store gas cylinders properly. The company faces more than $1.87 million in fines this year for exposing workers to multiple safety and health violations. Read the news release for more information. OSHA cited LC United Painting Co. of Sterling Heights, Mich., for 40 serious safety and health violations after a worker was seriously injured from a fall inside a water tower he was repainting. OSHA inspectors found that the employer had failed to provide the worker with adequate fall protection. Other violations included: failure to develop permit-required confined space procedures; neglecting to erect and inspect scaffolding correctly; lack of a proper respiratory protection program; electrical safety hazards; improper storage of compressed gas, fuel and oxygen cylinders; and lack of a hearing conservation program. Proposed penalties total $178,640. For more information, see the news release. OSHA issued two citations to Symrise Inc., a flavoring and fragrance manufacturer in Branchburg, N.J., for exposing workers to diacetyl, a chemical linked to respiratory illnesses including potentially fatal lung damage. Other violations found by OSHA inspectors included exposing workers to hazards related to confined spaces, the sudden startup of equipment during service, flammable liquids and platforms without railings. Proposed penalties are $122,000. For more information, see the news release. OSHA cited aerospace parts manufacturer Wyman Gordon for three repeated and 10 serious violations of workplace safety standards at its North Grafton plant. The inspection found electrical panels damaged by forklifts, blocked access to electrical panels, as well as inadequately guarded band saws and a milling machine. OSHA had previously cited Wyman Gordon in 2013 and 2011 for similar hazards at this plant and at one in Cleveland, Ohio. Inspectors also identified several new violations such as exposed electrical conductors and failure to ensure that workers used seat belts while operating powered industrial trucks. Proposed penalties are $145,600. See the news release for more information. Roofing company owner James J. McCullagh pleaded guilty Dec. 9 criminal penalties, including willfully violating an OSHA regulation causing death to an employee, making false statements, and obstructing justice. The case stems from a 2014 incident where a worker who was not provided with fall protection fell 45 feet from a roof while performing roofing repairs on a church in Philadelphia. "No penalty can bring back the life of this employee, but the outcome in this case will send a clear message," said Assistant Secretary of Labor for Occupational Safety and Health Dr. David Michaels. For more information, see the full statement. The defendant faces a maximum statutory sentence of 25 years in prison, a possible fine, supervised release, and a $510 special assessment. The Alaska Occupational Safety and Health Administration issued eight citations against Hartman Construction & Equipment Inc., and fined the company $560,000, after its willful failure to adhere to safety standards led to a 23-year-old worker's death. Samuel Morgan died at an Anchorage worksite when he was partially buried in a trench collapse and then mangled by the construction company’s equipment. For more information, read the AKOSH news release. California OSHA cited Kaiser Foundation Hospitals in Vallejo, Calif., $149,900 for exposing three workers to hazards from used needles at the hospital's overflowing collection boxes for biomedical waste. Cal/OSHA cited Kaiser for five workplace safety violations of the state's bloodborne pathogens standard after inspectors determined that Kaiser was aware that an unsafe or hazardous condition existed and made no reasonable effort to eliminate the condition. 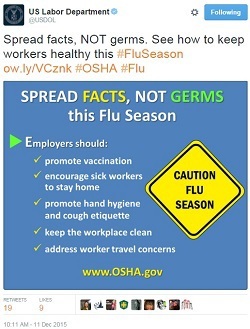 For more information, read the Cal/OSHA news release. The Washington Division of Occupational Safety and Health issued 31 citations to the Chehalis Inn & Suites in Tumwater and fined the company $97,810 after inspectors determined that the Inn exposed workers to infectious diseases, corrosive chemicals and carcinogenic asbestos. Other violations included exposing workers to fall hazards, unprotected wires and other electrical hazards, and failing to hold monthly safety meetings for workers. For more information, read the Washington DOSH news release. RCL Wiring LP, which operates as Idaho & Sedalia Transportation Company, harassed and terminated a signal shop technician in retaliation for reporting a work-related injury in violation of the Federal Railroad Safety Act, OSHA investigators determined. OSHA has ordered the company to give the employee his job back and pay more than $332,469 in back wages and damages, as well as reasonable attorney’s fees. OSHA also ordered Idaho & Sedalia to remove disciplinary information from the employee's personnel record and provide information about whistleblower rights to its employees. For more information, see the news release. OSHA has tested the air during hair smoothing treatments at various salons nationwide. In three salons, OSHA found that measured levels of formaldehyde exceeded the short-term exposure limit of 2 parts per million. A federal court has ordered Salon Zoe to pay $65,000 in lost wages and $100,000 in compensatory damages to a former receptionist who was illegally fired after distributing OSHA materials to coworkers. In June 2012, the worker gave her colleagues an OSHA fact sheet about formaldehyde hazards posed by a hair straightener used in their workplace. The Department of Labor filed a lawsuit in federal court against Salon Zoe and its owner, Kristina Veljovic, after attempts to settle the matter failed. For more information, see the news release. The U.S. Department of Labor filed a lawsuit against Eastern Awning Systems Inc., finding that the company unlawfully discharged two workers who filed safety and health complaints with OSHA. The employees filed the complaints after they became ill while working in the plant's powder coat room in 2009. Based on the complaints, OSHA conducted an inspection and cited the company for willfully exposing workers to inhalation hazards and for lack of adequate ventilation. While the OSHA inspection was ongoing, the company discharged the two workers, who then filed whistleblower complaints with OSHA. For more information, see the news release. Secretary of Labor Thomas E. Perez appointed seven members to serve on the Whistleblower Protection Advisory Committee. Six members will serve through Nov. 30, 2017. The federal member will serve through Nov. 30, 2016. WPAC was established to advise and make recommendations to the secretary of labor and the assistant secretary for occupational safety and health on ways to improve the fairness, efficiency, effectiveness and transparency of OSHA's whistleblower protection activities. OSHA's factsheet, Filing Whistleblower Complaints under Section 11(c) of the OSH Act of 1970, is now available in Spanish. The fact sheet explains that employers are prohibited from retaliating against employees for exercising a variety of rights guaranteed under the OSH Act, such as filing a safety and health complaint with OSHA, raising a health and safety concern with their employers, participating in an OSHA inspection, or reporting a work-related injury or illness. OSHA enforces the whistleblower provisions of 22 statutes that protect workers from retaliation when raising safety and health issues on the job or reporting violations of laws in various industries. For more information, visit the Whistleblower webpage in English or Spanish. OSHA has renewed its alliance with Altec Industries Inc. to help protect the safety and health of workers in the utility, telecommunications and construction industries. The alliance will focus on the safe operation, use and maintenance of equipment in these industries, including cranes, chippers, digger derricks and aerial devices. It will also help workers better understand their workplace rights and employers' responsibilities. The agreement will remain in effect for five years. For more information, read the news release. OSHA has renewed an alliance with Lamar Advertising Company to help prevent workplace injuries, illnesses and fatalities. Over the next five years, Lamar Advertising will help raise awareness of OSHA initiatives and outreach campaigns — including Stand-Down to Prevent Falls and Heat Illness Prevention — using its outdoor billboards across the country. Over the past two years, Lamar has displayed OSHA safety and health messages on nearly 100 billboards, resulting in about 5 million views. OSHA and Lamar Advertising will also develop ways to reach small construction contractors, discuss safety and health issues in the construction industry, and help design a construction safety training course. Last month, as part of its Alliance with OSHA, the Association of Energy Service Companies provided free training on hydrogen sulfide hazards to agency staff and AESC members at the University of Texas at Arlington OSHA Education Center. Hydrogen sulfide is a significant hazard in the oil and gas industry. According to the U.S. Bureau of Labor Statistics, 64 workers died from hydrogen sulfide exposure between 2003 and 2012—an average of seven deaths per year. More than 30 people attended the training, including inspectors from OSHA's Dallas and Fort Worth Area Offices. OSHA and AESC signed an Alliance in 2013 to provide AESC members and others with information, guidance, and access to training resources that will help them protect the health and safety of workers, particularly by reducing and preventing exposure to all hazards in the oil and gas well servicing industry. For more information, read the story on OSHA's website. OSHA, the National Institute for Occupational Safety and Health, and the Center for Construction Research and Training will hold the third annual National Safety Stand-Down May 2-6, 2016, to raise awareness of the serious risk of falls in the workplace. Falls are the leading cause of death in the construction industry, and lack of proper fall protection remains the most frequently cited violation by OSHA. More than 4 million workers have participated in the last two years, dedicating themselves to on-the-job safety. This year the stand-down will highlight the safe use of ladders and encourage employers to pause during their workday for topic talks, demonstrations and training on how to prevent falls. For more information on the success of last year’s stand-down, see the final data report. Visit the 2016 National Safety Stand-Down webpage for more updates. Control room windows damaged by steel furnace explosion. OSHA has posted a new Safety and Health Information Bulletin on Carbon Monoxide Explosion Hazards in Electric Arc Furnace Steelmaking Operations. The bulletin was developed after a May 2013 electric arc furnace explosion severely burned three workers through their personal protective equipment. The bulletin describes electric arc furnace explosion causes, how to prevent them, and how to protect workers. The Bureau of Labor Statistics has released interactive online charts illustrating the 1,157,410 nonfatal occupational injuries and illnesses that required days away from work in 2014. 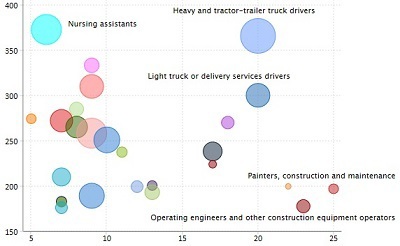 The charts show the incidence rates and median days away from work broken down by occupation, and the causes of injuries and illnesses most commonly suffered by workers in specific occupations. Moving your cursor over the circles and clicking on bars in the charts reveals additional information. The charts can be accessed on the BLS website. OSHA wishes you and yours happy holidays and a safe and healthy new year. QuickTakes will not be published on Jan. 1, so please continue to visit the agency's website for news and updates. Look for your next issue of QuickTakes on Jan. 15, 2016.